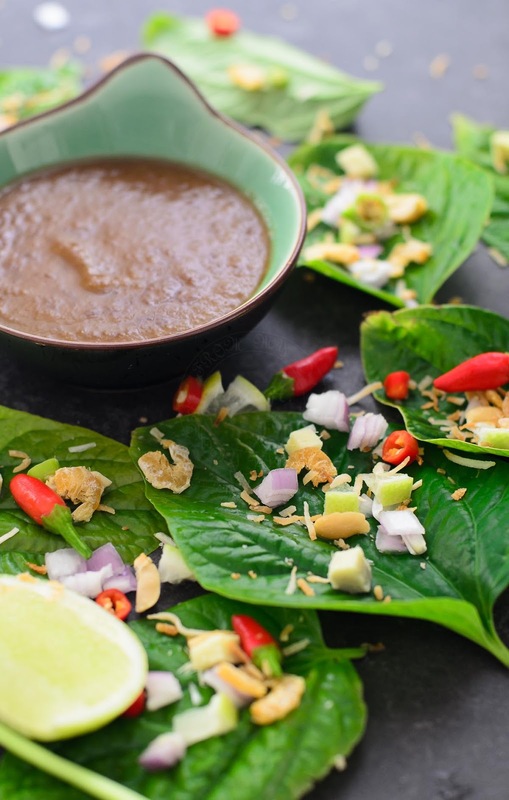 Miang Kham or Thai leaf wrap salad bite, is a popular Thai street food. 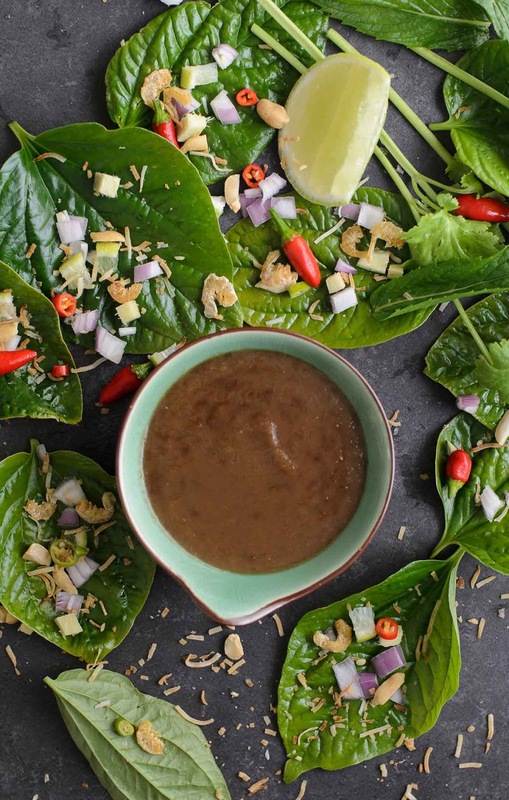 Miang kham, eaten in single bite, has all the Thai flavours of sour, sweet, spicy, tart and crunch. I am so thrill that I am able to have Miang Kham, here in Perth!!! Miang Kham is a popular Thai food. 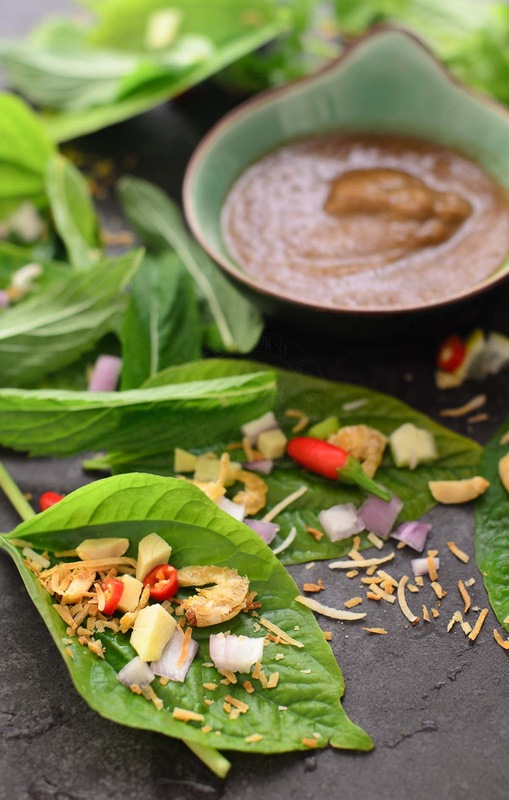 Miang Kham means One bite wrap (from google). How is Miang Kham eaten? Miang Kham consist of condiments such as diced fresh young ginger, fresh sliced chillies, toasted/roasted shredded coconut, fresh limes, roasted peanuts, diced shallots and dried shrimps. A little pinch of each condiments onto betel leaf (wild pepper), and dollop the gorgeous sauce, fold or wrap! Pop the whole wrap into your mouth. Now.... feel the magic happening in your palate! Burst of sweet, sour, tart, chilli heat and crunch, just like little fireworks, popping here and there, with every bite. The sauce is out of this world!!! 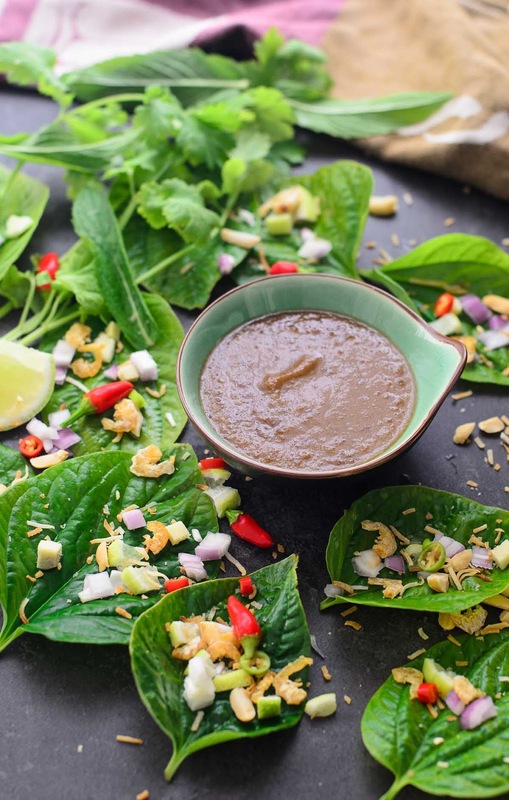 Few ingredients to make this thick beautiful delicious Miang Kham sauce. The sauce is sweet, with a hint of galangal, creamy and a very, very tiny hint of fishiness! 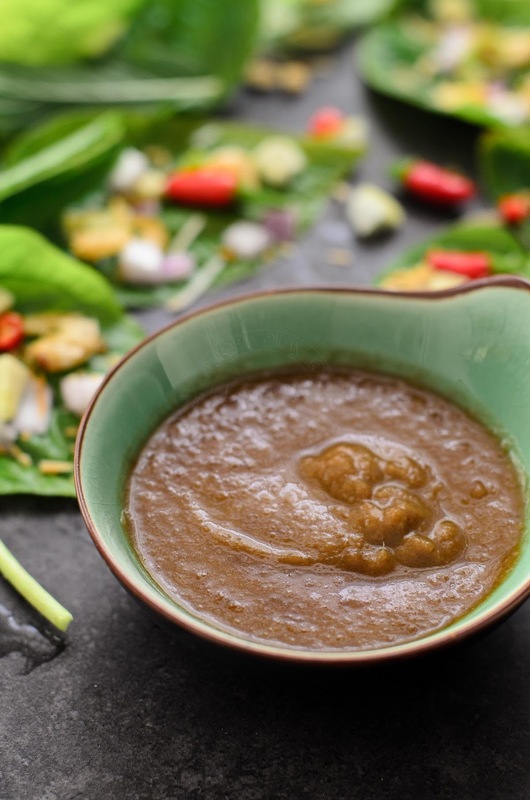 You will not have a clue what this gorgeous Miang Kham sauce made of, without looking at the ingredients. You must get the right leaves though! Apparently the leaves are called betel leaves. And there might be some confusions as there are 2 types of 'betel' leaves. Betel leaf that belongs to vine Piperaceae family. My mom used to grow this type and its mainly for chewing with a dash of slaked lime (kapur) and sliced betelnut. Betel leaf used for Miang Kam is known as Cha phlu, or wild pepper leaf. Broad heart shaped leaf and very glossy. Note : I tried eating with coriander leaves, mint leaf ... nothing compares to eating Miang Kham with 'betel' leaves. And I thought that I can only enjoy Miang Kham either in Malaysia or Thailand (my last visit in 2014, I asked for Miang Kham, no one seems to know.... ooops), but hey!!! I have Cha Phlu/ betel leaf / daun kaduk growing in my back yard. The leaves you see in my photos are from my garden! Although they comes in various sizes and shapes, its 100% organic, and I am super happy :D.
Miang Kham, traditional snack from Thailand. 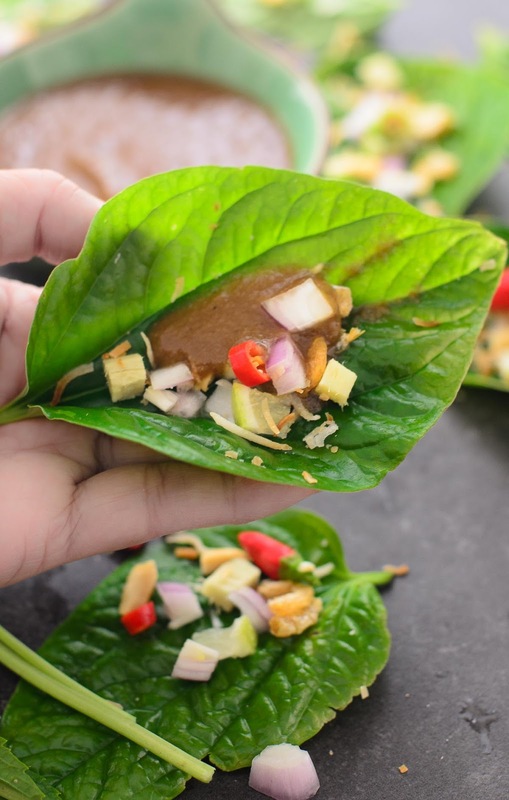 Miang Kham means One Bite Wrap. Wash dried shrimps and soak for 10 minutes. Then drain off water. Dry roast/ fry shrimp granules (belacan) with thinly sliced shallots and galangal until fragrant. Set aside to cool. Place the cooled dry roast ingredients above in food processor ( I used Nutribullet) with desiccated coconut, peanuts, dried shrimps and ginger. Add about 125ml (1/2 cup) water. Transfer the mixture to a medium size saucepan. Bring to boil and simmer until it is thicken and reduced to about 1 cup. YES - I love this! The flavors sound amazing and fresh and delicious! That sauce just sounds so good. I love dishes like this. I'm going to have to do some hunting to find those betel leaves, but I'm sure I can do it! Yes, the two are totally different, daun kadok and daun sireh. However, daun kadok is known as betel leaves on this side of the world :).